TELEDRAMA: A storyline based on 360 BC with four vibrant characters. A journey through the karmic cycle to the modern era. A conquest to break away from evil and corruption and a quest to bring back ancient wisdom and science... These is the process of events in store for viewers of Jayantha Chandrasiri’s newest teledrama set to hit on the small screen in September. Comprising 25 episodes Satara Denek Senpathiyo highlights the wisdom behind the traditional Sinhala customs and values, mainly traditional, indigenous medicine. The viewers are taken back to the past, running parallel to the present, to the time of King Buddhadasa, the great king renowned for his healing touch through native medicine. “Buddhadasa’s paradoxical role as king and healer inspired me. When you are a healer you are obligated to treat the poorest of the poor to the wealthiest of men, whereas when you are the king, you are expected to keep your distance from the common folk and rule from afar,” Chandrasiri explained adding that the protagonist is a doctor who treats patients at a hospital which had facilities to treat people from 10 villages. Sriyantha Mendis takes on the role of the doctor while Yasodha Wimaladharma plays the role of his wife. The other main characters are played by Roshan Pilapitiya and Mahendra Perera. Jackson Anthony puts up a guest appearance. Nuwan Jayatillake produces the teledrama and Ruwan Costa is the cameraman. The shooting took place in Galewala, Anuradhapura, Mihintale, Nuwera Eliya, Kegalle, Colombo and its suburbs. One speciality linked to this teledrama is its use of a variety of camera and lighting techniques. The reason for this is to differentiate the scenes related to 360 BC from the present. A lot of research by the director helped to showcase the backdrop and facts in a realistic manner. Popular actress, Yasodha will be taking on a role which is a complete turn over from those she had portrayed so far. “I play the role of a prostitute in the storyline related to the present. This is a daring and challenging role for me, the best I have been offered in my 22-years in the field,” she said. CINEMA: International award winning film director, Somarathna Dissanayaka is getting ready to shoot his new film Siri Raja. This film is produced by award winning film producer Renuka Balasooriya. This film - catering to schoolchildren - is based on a young lad who faced economic and social problems after getting a scholarship from a rural school to one in Colombo. Dissanayaka had to select 35 talented children from 2000 applicants from several districts in Sri Lanka. The kids had to face three interviews and he held a workshop to train them for this film. Balasooriya expects to commence and finish the shooting during the school holidays in August. Siri Raja is directed and written by Somarathna Dissanayaka. Music is by Rohana Weerasinghe. 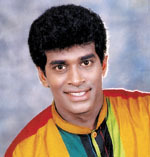 Jayalath Manorathna will take one of the lead roles. NEW DIRECTION: Well-known radio and television personality, Srimath Indrajith Liyanage, is busy with a series of programmes on Max TV and Max Radio. Srimath hosts the morning Suba Udesanak segment from 8 a.m. to 11.30 a.m. from Monday to Friday on Max TV in addition to other programmes like Galbore and Piyum Neela Wila on Max Radio. Having worked in a number of television channels, Srimath has made a name for himself as a journalist, artist, actor, singer and dubbing artist. 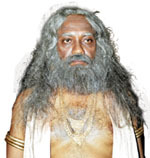 Srimath had acted in Rajya Sevaya Pinisai, Le Kiri Kandulu, Sonduru Dadabima, Piyambanna Asai, Asal Wesiyo, Panchayudha and Senehebara Dolly. He expressed his gratitude to the Max management for having confidence in him. BOOK LAUNCH: Upcoming young poet, Tharindu Weerasinghe, will be launching his first book of poetry titled “Candlelight” at the E.O.E Pereira Theatre, Faculty of Engineering at the University of Peradeniya. Professor Sunanda Mahendra will be the chief guest and key note speaker. Professor Aruna Wickramasinghe, the deputy vice chancellor of the faculty and professor Sarath Abaykoon, the dean of the faculty, will also be present. Songs composed by Tharindu will be presented by the students of the university. 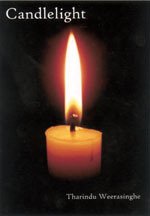 “Candlelight” is made up of 50 English poems composed by Tharindu. His creative scope derived from aspects such as nature, humanism, love, behaviour, religious susceptibilities, beauty and social injustice. “I dreamt of piecing this collection of poetry together for some time ever since I began writing after my school days. I am pleased that it became a reality. These poems are written within five years. Composing poems is not an easy matter as it takes a great amount of dedication, experience, thinking and sacrifice to come up with a good creation. I am still mastering the art but I believe that “Candlelight” will be a milestone in my journey,” Tharindu commented adding that he will be presenting the first copy of the book to his parents.